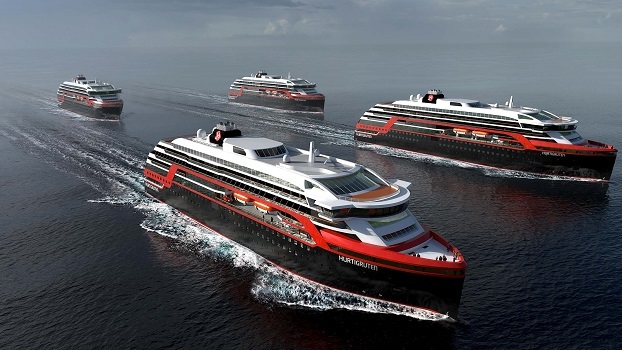 NORWEGIAN EXPLORATION travel company Hurtigruten has ordered two new explorer ships, designed and developed by Rolls-Royce, with the assistance of renowned Norwegian ship designer Espen Øino. The 600-passenger vessels, to be built at a Norwegian shipyard, will be customised for adventure expedition voyages in the Arctic and Antarctic, as well as along the Norwegian coastline. The deal – the largest in the company’s 120-year history – will see the ships delivered in 2018 and 2019. The new vessels will explore some of the world’s most beautiful and unspoilt natural regions, providing activities such as climbing and kayaking, tours on rigid inflatables, and whale and sea eagle safaris. On board, experts will give lectures on subjects such as history, zoology, botany, and environmental science relevant to the area of the voyage. In addition, experienced expedition teams will accompany passengers on educational excursions to isolated places that are accessible only by zodiac inflatable boats. Hurtigruten’s traditional area of travel is along the Norwegian coast, from Bergen to Kirkenes – the ideal destination for travellers looking for the Northern Lights. And the company has renewed its promise that any passenger who takes the classic 12-day round-trip voyage – described in last month’s issue of World of Cruising – will be given a free cruise if the lights fail to make an appearance. The deal, applicable to voyages between October this year and March 2017, also applies to its specialist astronomy voyage, which includes expert commentary and lectures from Dr John Mason MBE and science writer Ian Ridpath.